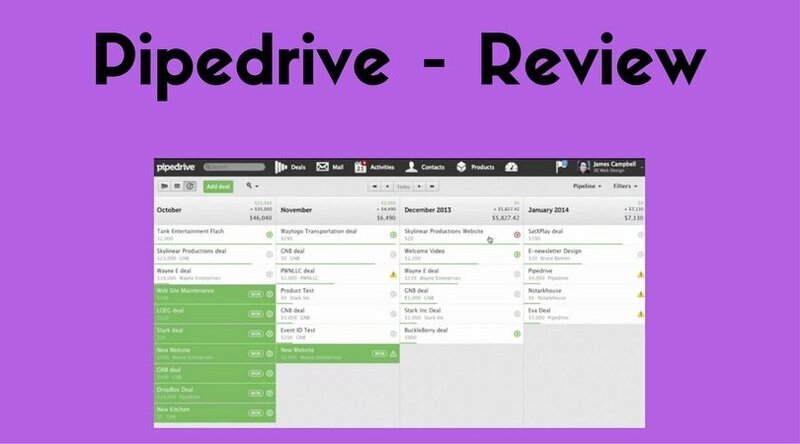 Considered to be the most loved choice of small and medium sized businesses around the world, Pipedrive is quite a simple yet powerful sales management tool and CRM. It is currently among the top CRM software present in the market. This genuine software is built by people from sales and experience web app developers. 1. Pipedrive allows you to organize your various business leads in quite a brilliant way which results in having a good overview of your sales. It allows you to attend the various deals with higher priority. When it comes to setting up an account, its quite simple and easy. 2. Pipedrive also provides you a seamless and efficient sales management via which you can focus on your different important deals. 3. Its interface and structure is quite user-friendly which allows sales persons to use it via a computer or any mobile device. 4. It allows integration with Google Calendar, Contacts, and various other Google apps. 5. This software provides you with the ability to manage your business’s sales pipeline in quite an efficient manner. 1. With sales pipeline methodology built into this software, your sales team will always have a positive response towards this software when it comes to leads management. 2. It provides distinct deals according to their sales stages which allow you to have a watch on your sales team performance and also check which deals need extra attention and work. 3. With its easy customization options, you can easily introduce customized fields to alter and adjust your sales pipeline’s stages as per your business requirement. 4. It allows you to manage the sales pipeline while on the move via its mobile apps. 5. It provides data backup in real time on a different server. 5. Its other benefits consist of email integration along with 24/7 support, integration with Google apps and is available in multiple languages. Well there aren’t any significant drawbacks of this software, sometimes it can create little clutter which may confuse the user. Rest, all the features of this software are quite intuitive and easy to follow. Pipedrive is a highly secure app which assists in selecting the right deals and offers attention to these deals. With its smooth integration of various apps with its API, it makes the task for small business owners, quite easy. It provides a crystal clear overview of your sales pipeline. Its Timeline view brings extra attention to important deals. This CRM software provides support via email, telephonic support, etc. It provides a reliable backup to your data. With this, we end our review on Pipeline CRM software. As discussed above, this software has quite distinct and powerful features which propel it to be among the best CRM software available in the market. Do try this out in case you own a small business in case you are looking for a CRM software. Share your experiences with us. Also, leave your views and suggestion in the comment section below.